Spoiler: assuming you want to deploy some simple PHP apps, PHPFog looks better for PHP than DotCloud. DotCloud and PHPFog are two “Heroku for X” cloud hosting providers. Basically, they make it easier to run your code in the cloud than using your own Amazon Web Services account. Which isn’t too hard either, and there’s a free level, but it does involve some sysadmin-like tasks, and you have to get your head around all the Amazon settings etc. In other words, sysadmin stuff, which is exactly what you’re trying to avoid. DotCloud and PHPFog both promise to take care of those headaches for you, in return for a slightly higher price than AWS. PHPFog is (as the name suggests) focused on PHP. Dotcloud does a lot of languages, but supports PHP too. The whole idea is to make your life easier. Sounds like a deal! Let’s compare them. Remembering that anything that gives me more sysadmin-like work is bad. I’m paying you to take that away. The first problem with DotCloud is that they use Nginx, not Apache, and therefore you can’t use mod_rewrite. Not only is mod_rewrite superstandard, but now I also have to install Nginx locally. Nothing against Nginx (it’s awesome), but more work for me, not less. Not good. Second, DotCloud doesn’t support Windows, officially. I develop on Windows. “Not supported” doesn’t make me feel good. Next, PHPFog has a bunch of PHP-related niceties. They give you a PHPMyAdmin setup out of the box to manage your database. A bit 90s, but nice. 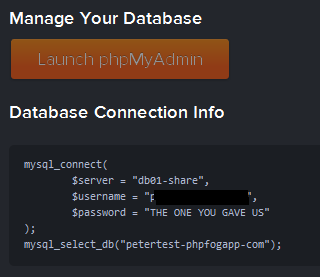 They even give you the code to connect to your database right there. Nice. Making my life easier is good. All in all, DotCloud seems the more “professional” outfit, they support a lot more languages etc. But PHPFog is focused on actual PHP developers, not treating PHP as an add-on, something to check off the list. Now I haven’t actually used both extensively, so this is a fairly superficial comparison. Thoughts? Previous postWill pepper spray also be classified as a vegetable? Thanks for the write up! Be sure to check out AppFog (www.appfog.com) which is the next generation of the PHP Fog platform built on top of the open-source Cloud Foundry project, wrapped with our incredible user experience and back-end services that make it easy to deploy and manage your apps. AppFog is in beta currently and supports a much broader range of technologies and services such as: Ruby, Java, Node, PHP (more to come) and MySQL, MongoDB, Redis (more to come here as well).